Three events went on across the country over the weekend of September 11-13. Here is a brief recap of the action at each event. Craig Durning was the big winner at this Dome Valley Raceway (Wellton, AZ) event. 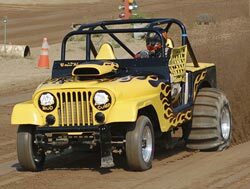 Durning drove “Eugene the Jeep” to the Pro Car Bracket Shootout class victory over Keith Ahart. Ahart came back and was victorious in the Pro 1 class. Art Cronin stole the show in the Fast Fours class taking the win with a string of mid-2.8 passes defeating Mario Tavares in the final round. Below are results from this event. Tulsa Motocross Park & Sand Drag Raceway had a rain out on September 19. Here is the flyer on their upcoming events at this new race track. 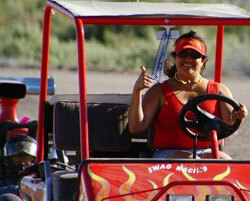 Cars and ATV’s are welcome at this track. For more info, visit their web site or call the phone number listed on the flyer. 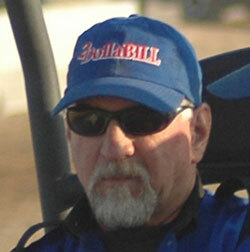 The sand drag racing community has suffered another huge loss this week. Barbi Erwin, wife of Mike “Swag” Erwin, passed away on Monday. Barbi was a huge supporter of the Swag Racing team and was by her husband’s side as he won the 2008 NSDA Pro 1 and Pro Mod championships as well as numerous other race wins throughout the South West. Barbi will be remembered by all for that warm smile and unmistakable laugh. The races truly will not be the same without her. NSDN sends our condolences out to the Erwin Family, Swag Racing Team, and all who were blessed enough to know this great woman. NSDN has been sent information on some upcoming September sand drag races. Race information on these events at Dome Valley Raceway, Thunder Valley Sand Drags, and Atoka Motorsports Park are all posted, click “Read More” to view. We are saddened to report on the sudden passing of Chittenden/Morris Racing crew chief, Dan Chittenden. 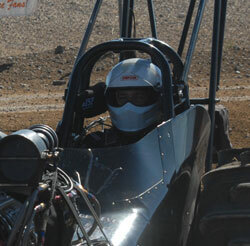 Dan was an accomplished crew chief on sand, tuning the 2 Dolla’ Bill Dragster driven by Billy Morris to the TE class point series lead in the 2009 NSDA series as well as guiding Rick Morris’ Heavy Metal World’s Fastest Buggy to the AA/B record with a 2.79. Dan was also an instrumental crew member in numerous drag boat world championships, including last year’s IHBA Top Fuel Hydro championship Speed Sports team. NSDN sends out our condolences to the Chittenden and Morris families as well as the numerous friends Dan has throughout the motor sports community. Dan was definitely one of a kind and will be sorely missed by all who had the pleasure of meeting him. Ionia Sand Drags in Ionia, MI held presented their Top Alcohol Shootout alongside the 2009 Pro Truck Nationals series at their July event. Cool conditions and cloudy skies made for great horse power weather and the numbers recorded were evidence of that. Let’s take a look at the action. The 17th Annual Appletree Automotive U.S. Sand Nationals featuring the 2009 Pro Truck Nationals series ended up being one of the largest events seen at West Michigan Sand Dragway in years. With entry numbers up over 200 and racers from all across the country, the race had a national event like feel to it. Let’s take a look at the racing action from this event. This month’s Featured Racer segment focuses on the husband-wife team of Nick & Tiffany Januik. Nick & Tiffany race primarily in the NSDA series on the west coast in the Top Alcohol and Top Eliminator classes. Their unique cars and high level of on track performance make them stand out from the crowd at each event they enter. Tiffany currently sits second in NSDA Top Eliminator points heading into the final two races of the year, while Nick is coming off of his first NSDA Top Alcohol win at Yuma in March and looks to be a contender for the remainder of the season. Here is more on this dynamic race team and family. The month of July saw some amazing racing in the state of Michigan. It was an amazing couple of weekends of racing action at both Ionia Sand Drags and WMSD. Let’s quickly list some of the highlights: the first 2.4 second ET outside of the west coast, a 220+ entry weekend at WMSD, 23 Pro Truck entries at the season finale, Josh Stephens running 3.0’s like a bracket car with his 4x4 Altered, Bob Gill resetting the A/Pro Jeep record nearly breaking into the 2’s with a 3.007 at Ionia, Ryan Wilson and Dan Wies batting around the B/4WD record both weekends, and a Pro Truck class championship decided on the last pass of the season. Not only did the last pass of the season in the Pro Truck class 2009 PTN season decide the championship, the margin of victory for Ben Dozeman was a mere one-thousandth of a second (.001). All this and I’d be remiss to not mention all of the racers that came in from across the country (California, Arizona, New Mexico, Missouri, Kentucky, Ohio, etc.). Big River Sand Drags in Bonne Terre, MO hosted a unique event Saturday night. The Inaugural Battle at Big River was an event run at a 200’ distance to entice local mud racers into a mud vs sand shootout. This event featured a Quick 8 class sponsored by Gallay Motorsports and a MRA Outlaw Pro Stock class. Read on for race results and remember that all times are 200’.